While it's true I didn't get to knit as much as I'd have liked over the holiday, I did get to knit. Starting with our drive down to Austin from Chicago, I had about fifteen hours of straight knitting time. I wasn't sure how many projects to bring for the duration--while I had plenty of room for stuff in the van, I knew I had to get it all back into one suitcase and a carry-on for the flight home. 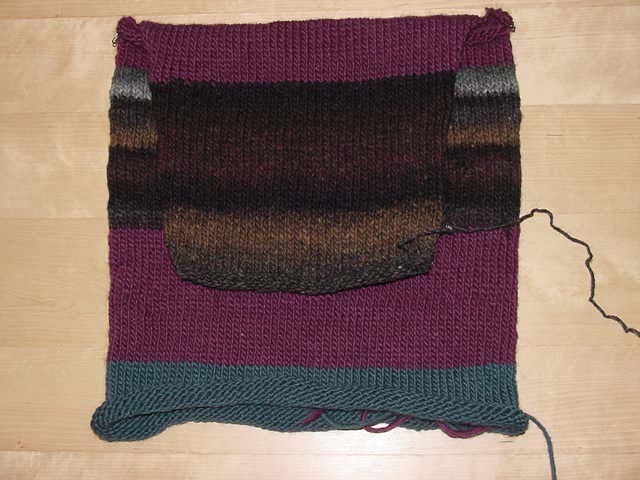 So I decided on just three projects--a new sweater (but which one? ), my Lorna's Laces sock, and I thought I'd be brave and bring the Koigu shawl as well (more on that later). But as I was packing I ran across a bag that had been sitting forgotten in a corner since the night several of us met at my friend Patty's house for a felting party last year. It's a little tradition of mine to start a new felting project while I'm felting the most recent ones, so that's what I did. And then I brought it home, put it in a bag, and never looked at it again. 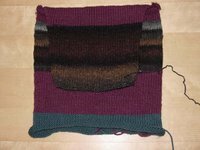 I had knit about five rows past the bottom border when I stopped. So when I looked at it when I was packing I thought, "Here's something I can just knit straight without having to think or count." So I threw it in my bag. The flash shows the pictures in the Kureyon better but kind of washes out the Lamb's Pride. The bottom has much more blue in it. I still have to do the handle and the sewing. I planned to finish it while I was there but started working on my other projects instead. Now I just wonder how long it will hang around waiting for me to do the finishing. More later--time to make lunch.